After the release of the Panama Papers, Ecuadorian President Rafael Correa boasted that unlike other nations, his country had not been involved with Mossack Fonseca, but it’s not all true. The Panama Papers were revealed early April, and contained 11.5 million documents from the firm Mossack Fonseca, Correa had demanded the entire data to be released. Meanwhile, records show Correa and his estranged brother, Fabricio, caught the attention of anti-corruption officials in Panama in 2012, according to McClatchy DC. Prosecutors in Panama said investigators looked into an offshore company in the Central-American country because of embezzlement concerns. A secret email found in the data leak shows Correa and his brother were at the center of the inquiry. The director of the offshore company has a direct link to Fabricio’s construction businesses. The director denied knowing the president’s brother. Ecuadorian journalists found three names of officials linked to Correa’s government who had appeared in the Panama Papers. Last week McClatchy found the email mentioning President Correa. “My name is Sara Montenegro, lawyer for Mossack Fonseca & Co. and I’m writing to notify you of an investigation being undertaken by the office of the Anti-Corruption Prosecutor of Panama, in reference to Misters FABRICIO CORREA and RAFAEL CORREA DELGADO for the crime of embezzlement against the Ecuadoran state, an investigation which involves a Panamanian corporation that was sold to you in 2006 called ORLION GROUP S.A.,” said the email. It was sent on May 4, 2012, to a lawyer working for the Legalsa & Asociados firm, which opened the offshore account on behalf of an unknown customer. The Orlion Group used the most clandestine form of offshore company ownership, which allowed individuals to hold a share certificate without revealing their name. The Panamanian firm had been trying to get hold of know-your-customer documents about the offshore Orlion for two years from the firm Legalsa & Asociados. In 2012, Mossack Fonseca decided to stop providing services for Orlion after they were contacted by anti-corruption officials. Legalsa & Asociados requested in 2014 on behalf of its unknown customer to reactive the company, but were denied. The revelation comes after Correa had bragged about his government. 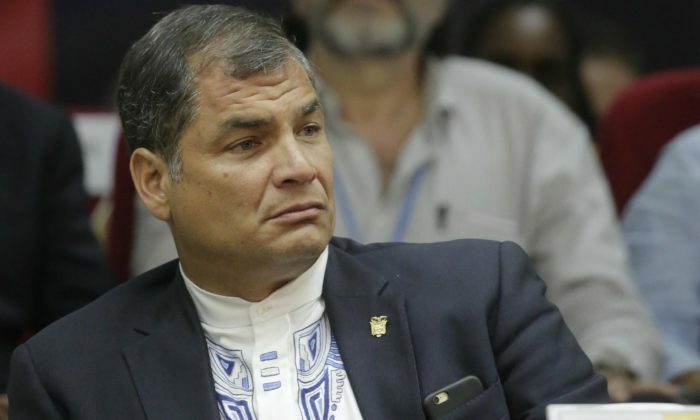 “They spent almost a year looking for something against the Ecuadoran government and they haven’t found anything,” Correa had posted on Twitter. However, when searching the word “Ecuador” more than 160,000 secret documents pop up, while the nation’s city of Guayaquil, shows up in 109,000 documents. The president’s brother told McClatchy in a phone interview he knew nothing of Orlion Group S.A. or its directors and that he’d never been contacted about it by officials in Panama. Transparency International ranked 168 countries and territories on its government corruption index, 106 of them were less corrupt than Ecuador.